JoeSunday night was a minor adventure. I had found a promising looking sublet listed on a database maintained by the Student Union (I must digress momentarily to wonder why this little gem was never mentioned in our months of apartment searching…Hmph. ), and a phone call to the owner resulted in an apointment to meet at the apartment Sunday night at 7. The apartment is in Gottsunda, an outlying neighborhood to the southwest, well out of walking distance but only a 15 minute bus ride, so it was obviously time to brave the buses. I don't want you to get the impression that the buses are frightening. They are large, clean, and well lit; what's more, they run from 6 in the morning to after midnight, even on the weekends for the most part, and they are both frequent and on time. In fact, they sound like a public transport dream, and they mostly are. There is just one small hump to get over: getting a ticket. 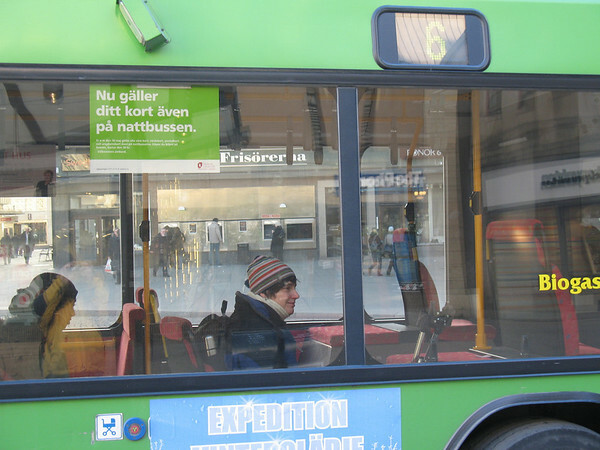 Now, you could certainly just get on the bus and pay cash money for a bus ticket, losing nothing in the process except for the respect of the bus driver and 30 SEK (that's $4.50 at the current exchange rate—yes, that's right, $4.50 to ride the bus). I hear you cry, "But Joe, what other option do I have? I need to ride the bus!" Oh, you have options, gentle reader, never you fear. Got a mobile phone? Why, just SMS the bus, and you'll be charged a mere 20 SEK (that's $3 for those of you who are keeping up with these things), and all you have to do is flash the SMS to the bus driver upon his arrival. No phone? 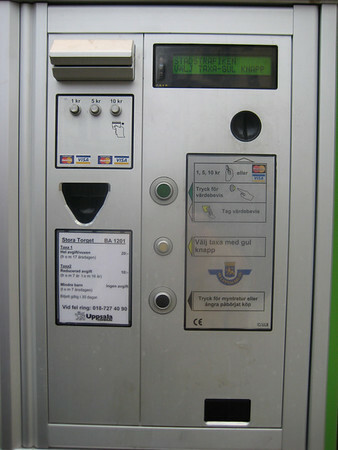 Well, proceed to the nearest major transfer point and purchase a ticket in advance from an automat (coins or credit cards only, please)—it can be used anytime in the next thirty days, and is good for unlimited bus rides in a 90 minute period once used (actually, that's true of all bus tickets in the city). But surely these methods must seem pedestrian (and thereby unsuited to a patron of public transit such as yourself). What truly elegant solution presents itself? Just buy a bus pass. What could be simpler? Wait, first you must choose: do you need a value card (värdekort) on which you load a few hundred kroner, thereafter using the card to purchase half price tickets on the bus (note that we're down to $2.25 now)? Or perhaps a monthly pass, unlimited rides for a mere 500 SEK (call it $75)? Even better, 4300 SEK ($665) for a year? Of course, there's alsoa couple of regional cards, something called a Tim-Kort (haven't the faintest), and a few other options. Oh, and don't forget the 75 SEK deposit for a card, plus maybe another 150 SEK for spärravgift or 75 SEK for expeditionsavgift (again, no clue). Oh, and some people claim there's a discount for university students, but the employees of the bus company do not appear to rank amongst them, so that one's probably a no go. All right, I know, what's really important here is the apartment. Long story short, it's a cute one room apartment (not a studio, the kitchen is a separate room, but the bedroom and living area are the same), on the ground floor of a little complex in Gottsunda, with a patio and a small garden. The owners have moved to a suburb of Stockholm to be closer to work, but don't want to give up their apartment (which they've lived in for 15 years), partly because it's about the same size as their new house, and they can't fit two apartments worth of furniture into it. So, they will happily leave us a set of simple furniture (for a little extra, of course). Oh, and they dote on their adorable dog Myra (sp? ), so they don't mind cats at all. They were at pains to point out that children were entirely unacceptable, but cats are fine. We agreed on a very reasonable rent, which took a little while due to a moderate language barrier (only one of the couple speaks English, so there was a lot of time spent translating back and forth). Then we ran into our two hitches: the form for the sublet requires our personal numbers, which the state won't issue for another week or so, and after the application we have to wait another 2-3 weeks to get approval from Uppsalahem (the landlord) for the sublet. Ouch. Four more weeks? Nothing for it, though, as we would run into the same trouble at any other place. So, we're off to work on interim housing. Jennifer found a hostel-apartment typ place through a new colleague, and they appear to have an apartment available for a month for a mere 8000 SEK ($1200), which is OK for one month. Certainly better than the 800 SEK a night for a cheap hotel room.